Documents with inserted Delphi controls is a unique feature of TRichView. You can insert any Delphi control and it will work just like on a form (with one exception – it will be positioned in a proper place inside the document by the TRichView). Documents with inserted controls (with all their published properties) can be saved in files or database fields in a special format (RichView Format) or XML. 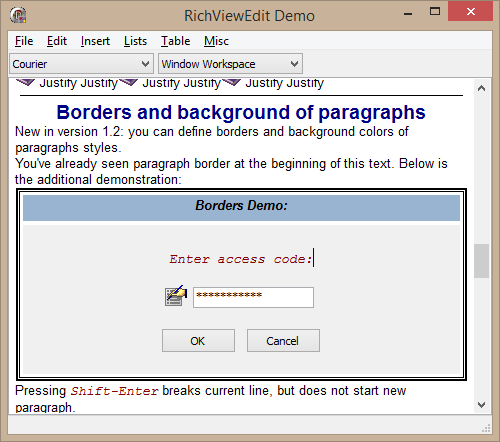 TRichView provides events so that programmers can write code for exporting controls to RTF, DocX and HTML, and printing. How to insert a button playing WAV file. In the examples with AVI, SWF and WAV, media files are stored directly in document (in RVF format).